Can you believe we've only got just one more day before Valentine's day. I'm ready for it to be here and gone. After planning, shopping, and prepping for a school party I'm just about done with Valentine's Day. Bring on St. Patties! However, I had to sneak in just one more V-day post. If you are still looking for a really quick idea here are a couple I whipped up this morning. As for the mazes. I made these for my kids at church. They were super easy and really inexpensive. 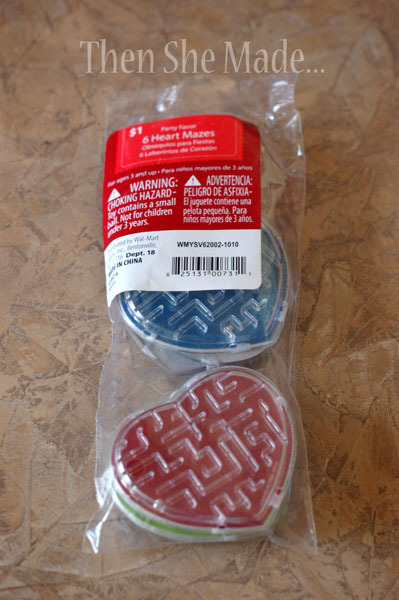 You can buy a package of 6 heart shaped mazes at Walmart for only $1. So, there you have it... two really super easy, quick, and inexpensive Valentine's ideas! P.S. Step 3 for our cookie sheet calendars is coming, gotta get the school party out of the way first, so stay tuned. What are the mazes glued on to? It looks to thick to just be card stock. Vicki, they are just on card stock. Nothing fancy. Love these cards. Did you paint the back of the cards red? Or only the edges? @kerri - Thanks! I just inked the edges with some red ink. Super easy and quick.